ARIES (March 21 – April 19): You’ve reached a new level of optimism this week, which is hella stupid. But I applaud your attempts to remain positive despite all the negative things that are coming your way. TAURUS (April 20 – May 20): This week will remind you of a simpler time. A time when you were roughly 10 pounds lighter, three shades darker and probably six times more attractive. It’s nice to shed that winter body and eat more lettuce than Kraft noodles and processed cheese. GEMINI (May 21 – June 20): It’s just all bad. Between the projects and the papers and the tests and the reminders you had to set on your phone to make sure you get in a shower, it’s like the world is ending. Don’t worry, there is a light at the end of the tunnel. Probably. Hopefully … maybe. CANCER (June 21 – July 22): You’ve been out of your parents’ house for a while now. You’ve learned recently that living on your own is fantastic. You can do whatever you want! You can eat six packages of Reese’s Easter eggs! You just might start looking like a Taurus if you’re not careful though. LEO (July 23 – Aug. 22): Running away from your problems is the easy way out. Honestly, the stars are telling me that this is your best option. RUN, FORREST, RUN. VIRGO (Aug. 23 – Sept. 22): Are you looking for love in all the wrong places? You might as well stop what you’re doing and grab some ice cream because you will be single forever. So throw on the sweats, put your hair up and adopt a cat. LIBRA (Sept. 23 – Oct. 22): Stop spending money and invest it in your friend, who is obviously the brain child of Bob Ross and Bill Gates. Big money ahead, but you didn’t hear it from me. 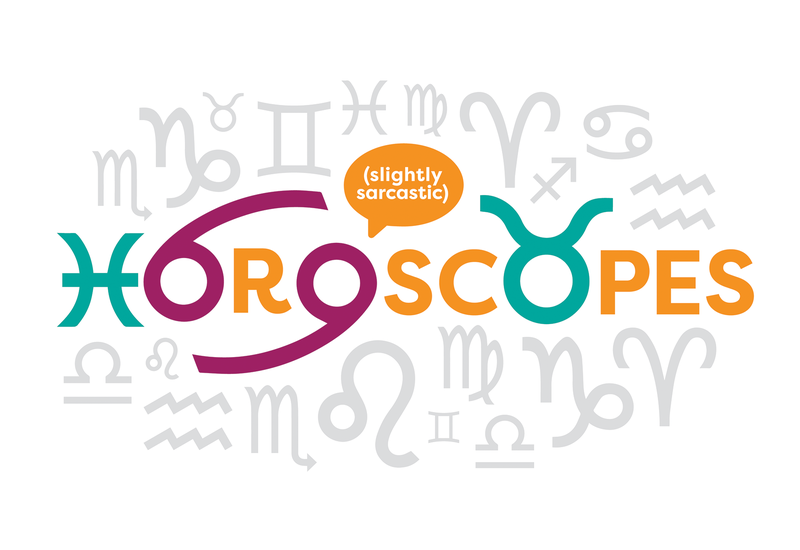 SCORPIO (Oct. 23 – Nov. 21): That person who sits four rows ahead of you that you’ve had a crush on all semester? You might as well put some hair on your peaches and ask them to the bars Friday. Who knows? They could be your next ex-lover. SAGITTARIUS (Nov. 22 – Dec. 21): Walk up to the person who puts a twinkle in your eye and lay a big one on ’em. Make it like the French … wink wink. CAPRICORN (Dec. 22 – Jan. 19): Everybody love everybody. Go wherever the wind takes you to find your lover. Hopefully it is very far away from me, like in Antarctica or something. AQUARIUS (Jan. 20 – Feb. 18): Still flipping burgers to pay the bills? You will be offered a new job and it might sound too good to be true, but take the damn thing. Your parents will be so proud that you are the new head fry cook.